Although Arenal is thought to again be dormant, our travel club was lucky enough to see it smoke! One of the most iconic volcanoes in the world, Arenal in Costa Rica’s northwestern district of La Fortuna is a must stop on a trip to this great Central American country. 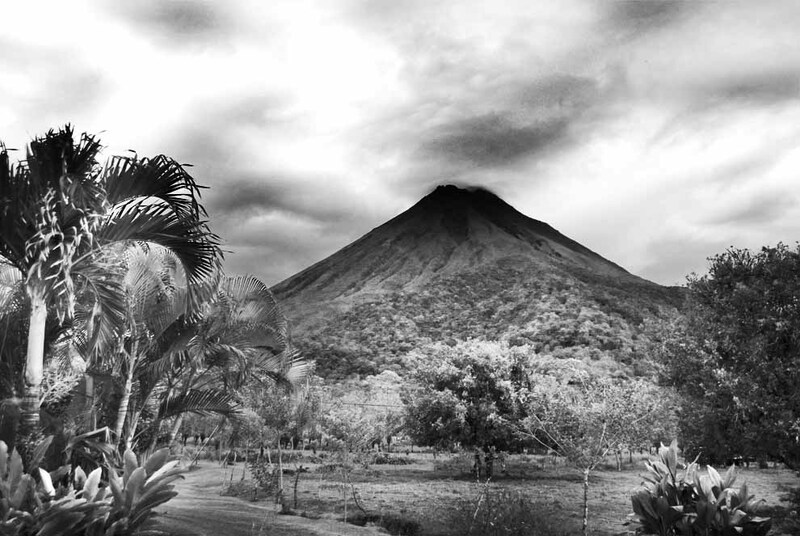 At roughly 3500 feet (for now), Arenal made world fame when it began actively erupting again in 1984. The brilliant eruptions and lava flows attracted tourists from all over the world and lasted until 2010. Our group tour to Costa Rica stayed at La Pradera, a great boutique hotel directly in front of the smoking mountain. As you can see in this shot we took right in front of our bungalow styled rooms, smoke began to rise from the top of Arenal. Although the volcano is now considered to be receding back into a dormant phase we were grateful to get awesome shots like this one as the caldera puffed out some final smoke (for now). What an incredible sight, even if it wasn’t erupting! I’ve been right at the base of it! I wanna go to Costa Rica. I can’t believe after everywhere we’ve been in the world, we haven’t been to Costa Rica. That is one beautiful volcano. Wow no way! Can’t believe you guys haven’t been yet either. When you finally make it there do the zip lining by Arenal–by far the best one we’ve ever done!